Jack Harper: Earth, before the war. New York, before I was born. A place I've only seen pictures of. I know you... But we've never met. I'm with you... But I don't know your name. I know I'm dreaming. But it feels like more than that. It feels like a memory. How can that be? Q: Who is "Bob" the bobble head on the helocopter that Jack flies? What does that have to do with the movie? Q: What scenes were filmed in Mammoth Lakes and June Lake, CA? 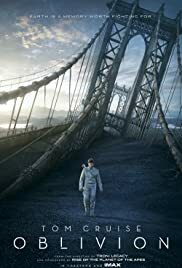 Q: Did 'Oblivion' take inspiration from the film 'Moon'? A unexpectedly really good movie. Without revealing any spoilers, I saw this movie "out of the blue". Never saw a trailer (I still haven't). I remember hearing the name of the movie and completely forgot about it, and just decided to take a chance and watch it on cable TV one night. It is a Sci-Fi movie with a human heart, so you don't need to be a science fiction fan to enjoy it. 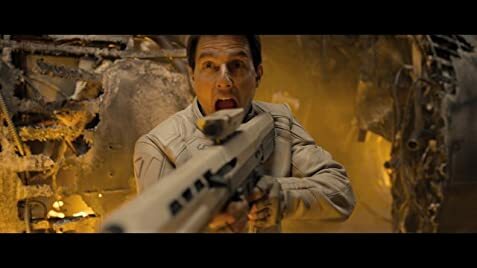 Also, I am not a Tom Cruise addict, but he does a great job in his usual way. In fact, all the actors portray their characters very well. There is mystery, action, a little bit of love, and some adventure. The beginning is good, there is a high point, and the ending of the movie is satisfactory in my opinion. The special effects are executed in a way not to take away from the story or the plot, and the story does not revolve around them, but rather they are just a part of the story. If you are looking for a good movie to watch, I have to say it is well worth the viewing, not too predictable. Sit back and relax, you'll enjoy this gem.